The BRICS Development Bank, an association consisting of Brazil, Russia, India, China and South Africa, has begun operations. On the eve of the BRICS summit in Ufa on July 8, the heads of the central banks of the participating countries have also announced an agreement on the creation of a BRICS currency pool. 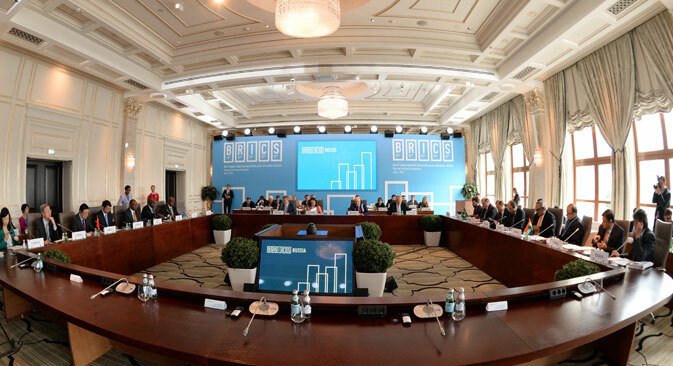 Russian Finance Minister Anton Siluanov has announced that the BRICS Development Bank, an association consisting of Brazil, Russia, India, China and South Africa, has commenced operation. According to Siluanov, the bank will receive a rating in the near future and by the end of the year will be able to finance its first projects. The bank, whose capital is $100 billion, is to be headed by Kundapur Vaman Kamath, former chief of India’s ICICI Bank, said Siluanov. The agreement on the creation of the BRICS Development Bank, whose main objective is to finance infrastructure projects in the BRICS and other developing countries, was signed one year ago. According to Siluanov, Russian projects applying for financing from the National Wealth Fund, such as the Rosneft projects, can apply for funds at the BRICS Bank. The minister also said that investments in external projects will be possible in the future, but for now the priority lies in investments in projects within the BRICS countries. Siluanov said that this also concerns Greece's current difficult economic situation. “It is possible that in the future projects in Greece and other countries may become those projects for which [the BRICS Bank] money will be allotted, but I think this will not happen soon, not in the near future." The issue of a closer financial union between the BRICS countries – a currency union – is not on the agenda for now, according to Siluanov. "Before the creation of a currency union many measures on the integration of fiscal, budgetary, customs legislation, technical regulations and other norms have to be implemented,” he said. “So today's agenda does not include the creation of a single currency union, a single currency." Besides the steps related to the new bank, on July 7 the heads of the BRICS countries' central banks signed an agreement on the currency reserves pool. The total volume of the BRICS countries' currency reserves pool is $100 billion. China will contribute $41 billion, while Brazil, India and Russia will provide $18 billion each and South Africa will put forward $5 billion. The pool has been established in order that the BRICS countries' central banks are able to lend each other resources in the event that they have problems with dollar liquidity, thus compensating for their budget deficit. According to Elvira Nabiullina, the chairwoman of the Russian Central Bank, the pool is "an insurance instrument" and that there is "no reason to believe that any of the member countries will be obliged to ask for the bank's help in the near future," adding that she does not see the necessity of creating real BRICS currency reserves. “In our point of view, the pool of conditional currency reserves and the precise definition of how this pool will work, which is included in the operational agreement, responds to those issues for which the pool was created – as an insurance instrument against financial risks and the risks related to the situation on the world financial markets," she said. Although Russian mass media are calling the BRICS currency pool "an alternative to the IMF", the Russian government is in no hurry to give such evaluations. According to Russian Deputy Finance Minister Sergei Storchak, the new BRICS financial mechanism should not be compared to the International Monetary Fund. "The comparison of the conditional currency reserves pool and the IMF is entirely wrong. They have nothing in common, except for references to the name. The IMF is an international organization, while the conditional currency reserves pool is a ‘wallet,’ the resources of which can be spent only with the advent of certain circumstances," he said.